India is witnessing significant surge in the Foreign Direct Investment inflows. This significant increase in FDI inflows to India is a yield of liberalization of economy, which saw light in the early 1990s. There was also a gradual opening up of the capital account that gave a boost to not only the economic zones in India but also offered a thrust to the industrial sectors here. At the moment, you, as an Indian are lucky enough to bask under the glory of the booming fiscal scenario that the nation is witnessing. Moreover, the new ‘Modi’ government has also brought in a lot of positivity for the country. As the economy is flourishing, you can expect the industrial sectors to grow and salaries as well at the same rate. However, you will be surprised to know that there is one more entity that is strengthening our economy; foreign direct investment or popularly abbreviated as FDI. Almost all the countries around the world are riding on the success of their respective economies. You may owe the success to the new government, policies or sometimes the success of the industrial sectors but you have to get your facts a little updated as there is a new name added to the contributors and that is Foreign Direct Investment. With increasing FDI inflows in the realty sector of India, you may now expect a range of residential spaces that will at par with the design standards. India has some of the fool-proof strategies in-hand that is surely going to woo the international players soliciting investments for major projects. 1. There should be a 100% routing of FDI in stationing and promotion of townships, built-up infrastructure and construction development projects. 2. The Department of Industrial Policy and Promotion has also permitted FDI inflows towards constriction of premises and commercial infrastructure, such as hospitals, educational institutions and recreational facilities. 3. The realtors who have taken the task of accomplishing heavily capitalized construction of roads and bridges can expect fortunes as government has permitted a good portion of FDI towards making roads, bridges and transit systems. 4. Talking specifically about the amount to be incurred; it can now safely declared that real estate department is now almost out of the hibernation period as FDI inflows is expected to reach to a whopping 16 billion dollars by 2015. With so much lined up to spruce up the domain, it can be indicated without an iota of doubt that real estate domain or the construction industry is an integral part of the Indian economy. With all the facts and figures and the significance of the FDI cited above, you must be all dazed as to why the government is involving itself heavily into attracting international players for incurring in capital. With your salaries increasing, you have this burning urge to have an improved line of housing options. The construction industry is very sensitive and thereby understands the concern. For you to have the home of your dreams in the best possible location and offered with modern amenities, the government is approaching foreign investors and international corporations. An improved accommodation option should be accompanied with better transport and road systems, aptly located commercial infrastructure and adequate sources to meet the power requirements of the people residing. The needs are enough to coax the government to take initiatives and mend policies that can permit investors to incur capital. The construction industry has a good appetite for ambitious projects and related capital as there is a need to give infrastructural makeover to major and Tier 2 Indian cities. Now this is something that every businessman and their entrepreneurial projects can look up to. If you are a business man who is seeking to get commercial realty space stationed then India can be your best deal. As per the new government policy, a good share of FDI inflows is planned to be invested for new businesses and commercialization. Tired of listening to the dark stories wherein, people tell you about their long wait for their dream homes to get completed. Well, this can be extremely frustrating and such scenarios can make one restless for sure. The new policy clearly indicates that the minimum built-up area requirement has been relaxed from 50,000 square meters to 20,000 square meters. The amendment is for sure towards allowing more and more FDI. With this, the foreign funds would flow more easily, which in turn would ensure timely completion of a given realty projects. The government of India has also raised the bar on upper limit on FDI to 10 million dollars from earlier 5 million dollars. This clearly indicates that the fund rotation in the realty domain will now be cheaper, easier and faster. You as a consumer should be happy about the fact as the yielded benefit will surely be bestowed upon you, soon. There is a lot of hope for the construction industry now as the recent budget announcements allowed FDI inflows to a good extent. Both the consumers and the builders can now expect fortunes in terms of improved options and better rates. I Second what Poornima has to say. Development in IT field and it could affect any field. 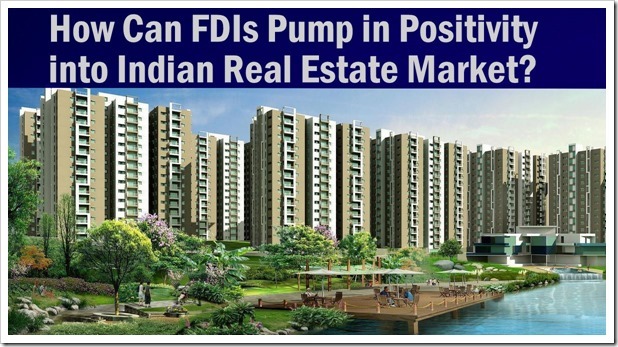 I wish the FDI in India really boost the Real estate sector. Home of Dreams is the aspirations of any Indians. With the improvement in IT sector the world itself opt to change itself. There is development in all fields related to that. The real estate market is the one mostly affected by this. With increase in the income people like to have better living facilities. Most of them opt luxury apartments from their small compact homes. The wide range of facilities made available by the builders are attracting the people. The interesting fact is that their are luxury villas affordable by even common middle class man.